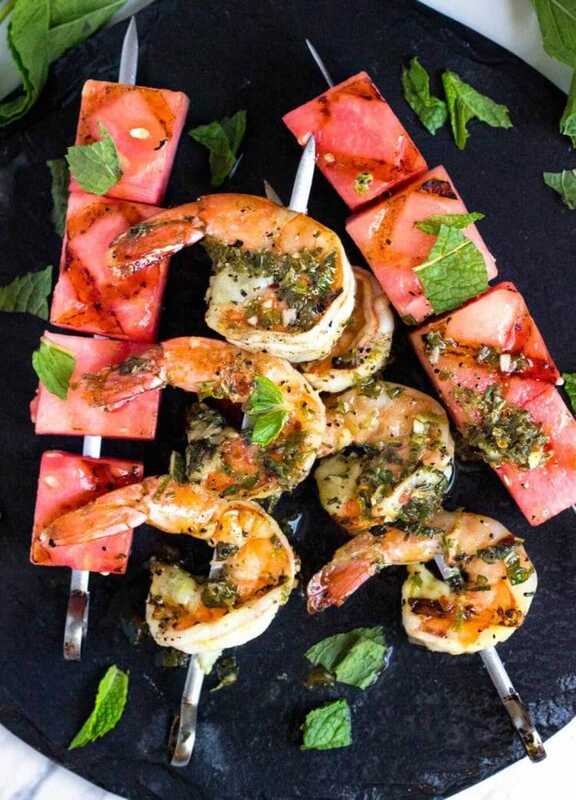 These Watermelon and Grilled Shrimp Skewers are a snap to make and the smoky flavor from the grill ads a depth of flavor to the sweet watermelon. 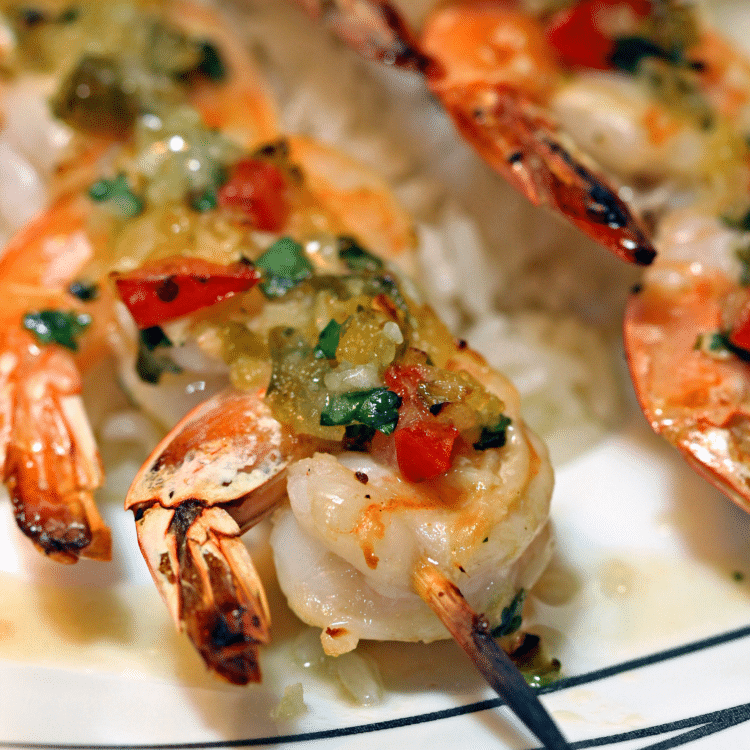 I love the use of fresh herbs when mixed with lime juice and a pinch of red pepper flakes that these shrimp marinade in. 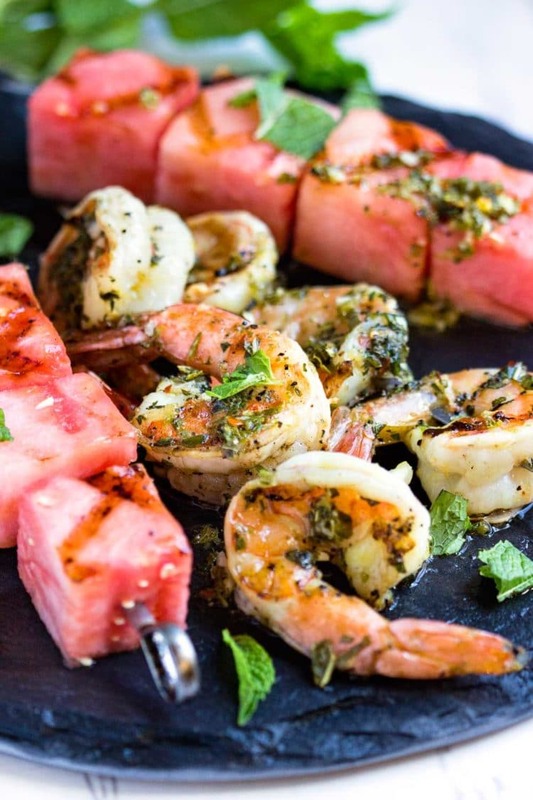 Cubed watermelon and the shrimp get loaded onto skewers to grill up and dinner is ready. Whether it’s grilling peaches or pineapples, roasting fresh fruit on the grill brings out a wonderful flavor and adds that smoky touch. 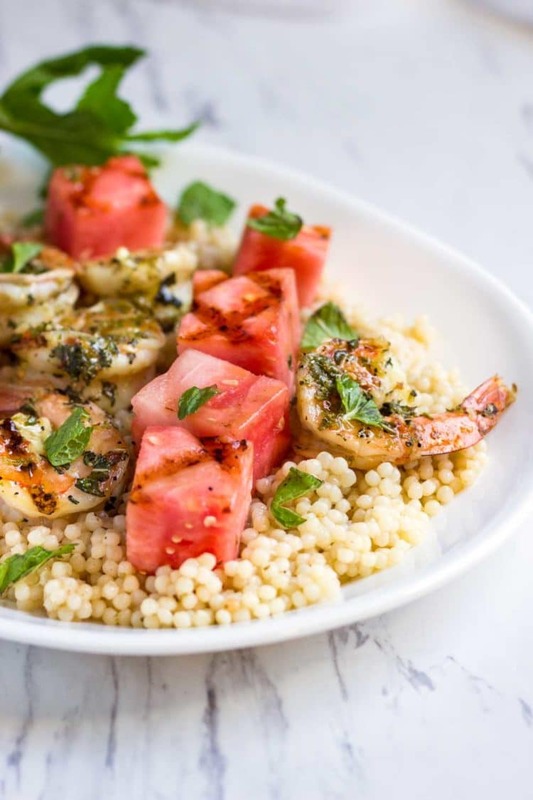 Cubing and doing the same to the watermelon here with marinated shrimp is the perfect answer to a light and refreshing meal. I served this over a bed of buttered couscous, which I had steamed with some fresh thyme. 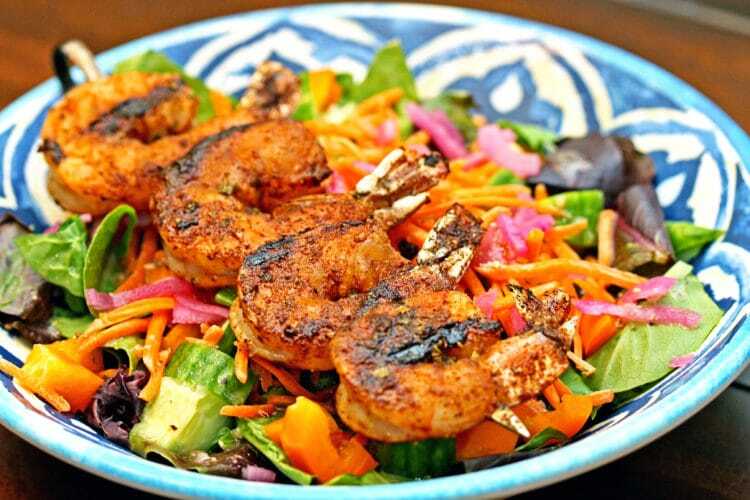 These Grilled Shrimp Skewers are a light and healthy dinner or lunch, perfect for this warm weather. One would think the watermelon is too watery, but it holds it’s own on the hot grill and the charred grilled marks prove it. 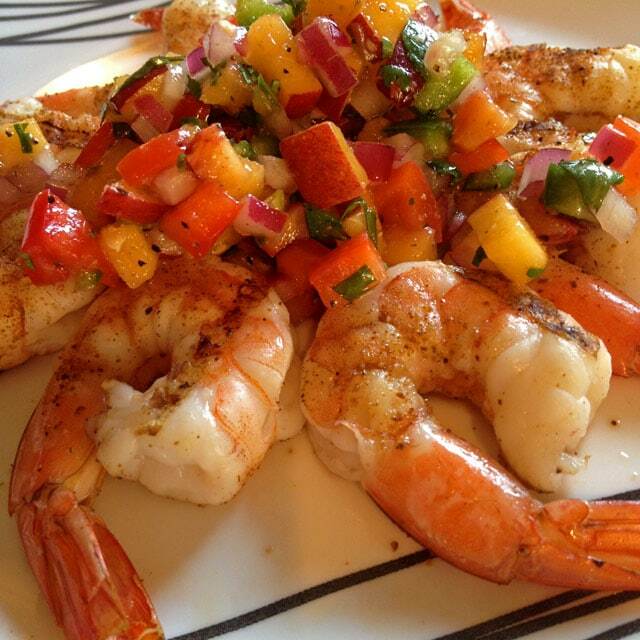 No turning to mush here they are a perfect paring with the citrus, herb marinated shrimp. 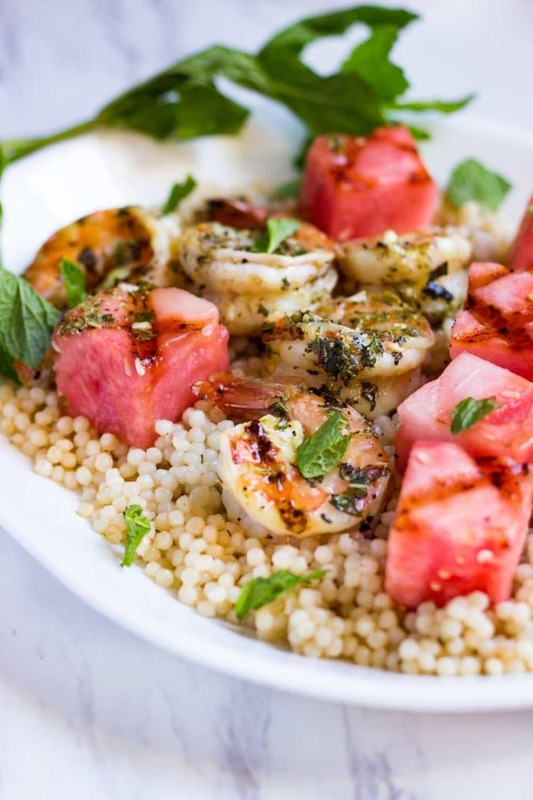 Just spoon some reserved marinade over the Grilled Shrimp Skewers and watermelon, top with a sprinkle of fresh mint and serve. Enjoy! If you like this try my Cumin Chile Lamb Kabobs, Beef and Lamb Kabobs, or these Yakitori Style Chicken Sausage with Sweet and Savory Taré Sauce. Adapted from Sunset magazine's August 2016 issue recipe by Romney Steele. In a small bowl whisk together the 1/3 cup oil, lime zest and juice, chopped mint, thyme, red pepper flakes, garlic, salt and pepper. 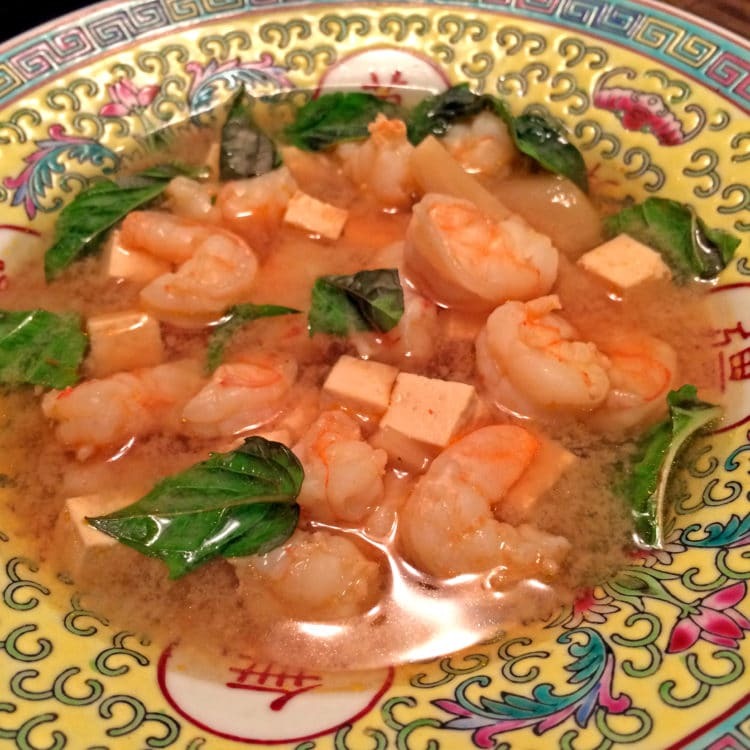 Pour half of marinade over shrimp in another small bowl. Cover and refrigerate for 1 hour. Set remaining marinade aside. Peel and cube watermelon into 1 inch cubes. Thread the watermelon onto skewers and brush the watermelon with remaining one tablespoon of oil. Thread the shrimp onto skewers being sure to pierce through top and bottom to form a C This will secure the shrimp so they lay flat. Grill watermelon on one side for 1-2 minutes to form grill marks. Remove from grill and set on serving tray. 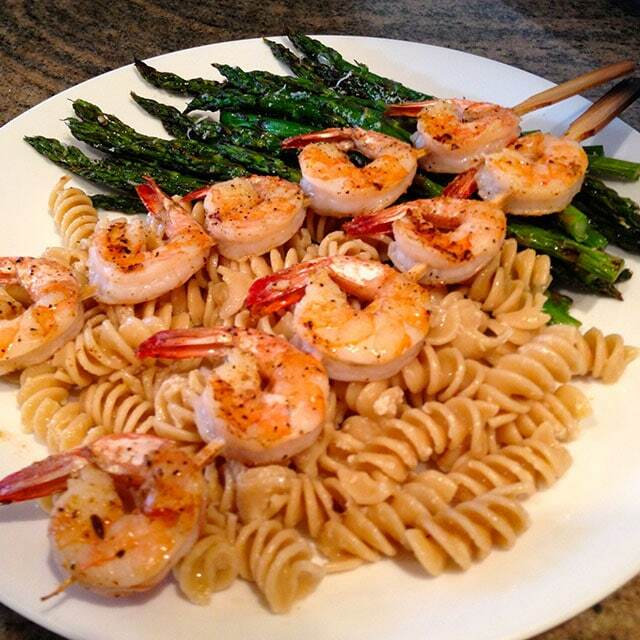 Grill shrimp for 1 minute, turning once and baste with some of the marinade and cook for another minute. Set on serving tray with watermelon and drizzle remaining marinade over all. Serve with torn mint leaves. 1. Fresh jumbo shrimp need to be rinsed, peeled and deveined. If using frozen, thaw first before marinating. 2. Two limes juiced came to 3 tablespoons juice needed. Zest one lime and use. 3. 1/2 a small seedless watermelon cubed was about 2 pounds. Hi, I made it yesterday and it was so delicious. I had never tried watermelon and shrimp together before, but the tastes complimented each other in a way I had not foreseen! Thanks Jakob, always glad to hear back from readers that they enjoyed a recipe. The herbs with that watermelon are so good, right? Have a great weekend. I’ve only tried grilling watermelon a couple of times, but I’d never thought to team it with prawns. Such an easy summery meal! 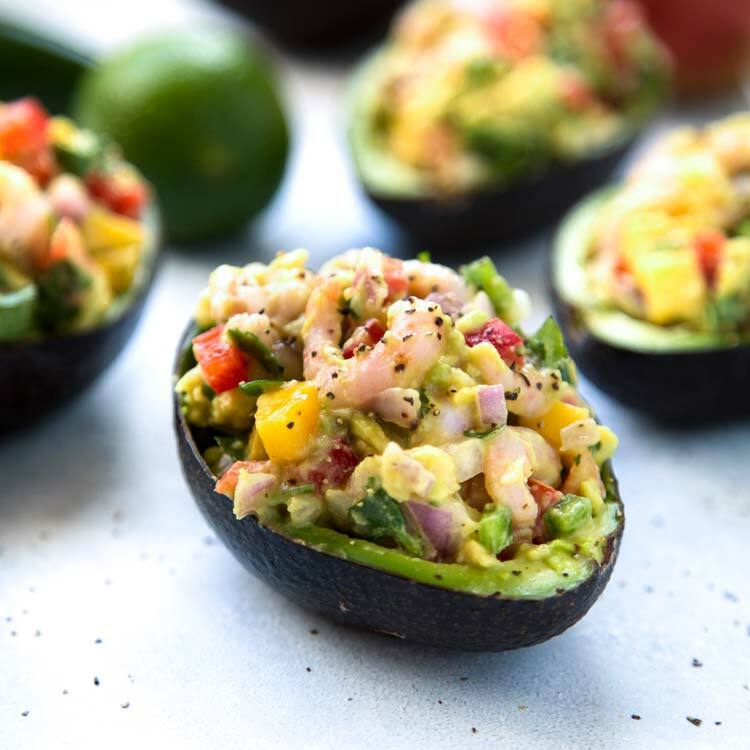 Super light and healthy with lots of flavor… I’m thinking this could be killer with peaches as well. Maybe this weekend! Thanks John. Damn Kevin! This sounds so fantastic!!!! I am IMPRESSED by this flavor combo man!!! I gotta try grilled watermelon! 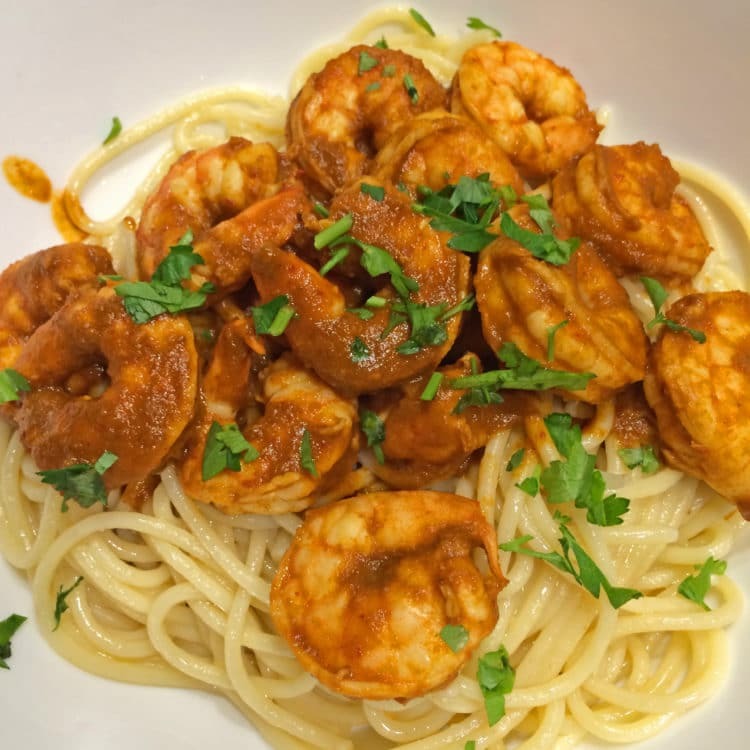 Super easy and tasty, gotta love it. Thanks Mila! I’ve never tried grilled watermelon, but I trust your words – it should be delicious. 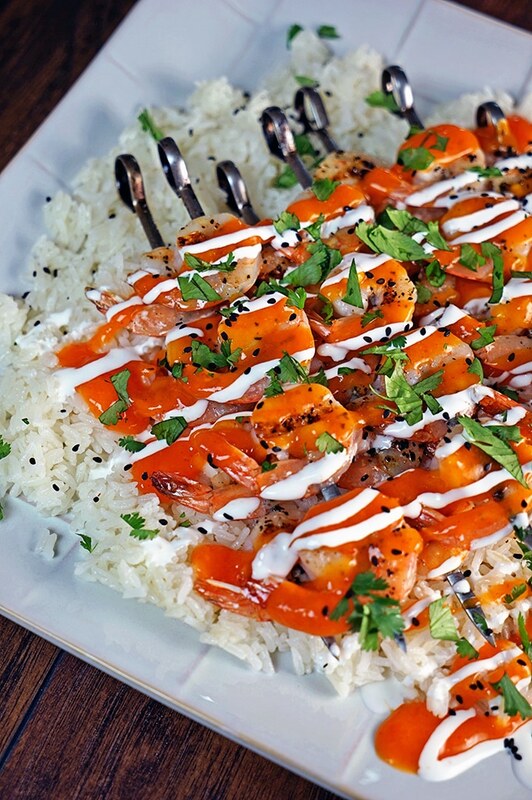 Combined with shrimp, buttery couscous, and fresh herbs…yes, yes, and yes! What a beautiful light but satisfying combo, Kevin! Oh wow Natasha, I hope you give it a try. Grilled watermelon, peaches and pineapple are my favorite fruit to grill. Grill on and thanks for stopping by! Wow Kevin, this is one amazing recipe! 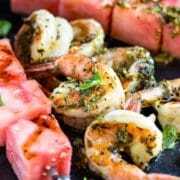 I adore watermelon – but never have I grilled it – wow – I can imagine those sweet juices caramelizing – what a wonderful accompaniment to that shrimp and ooh that marinade/dressing just beautifully ties everything together! Thanks Shashi. I also like grilling watermelon with a little sprinkle of lime and chili powder. Good stuff! Hey Kevin! We just finished up a really good, sweet watermelon that we bought from a truck vendor in town. Now I just have to find him again! I stocked up on shrimp when they were on sale recently, I have six pounds of jumbo shrimp in the freezer! This is perfect for the HOT weather we are having right now! I really like grilling fruit, it just makes the flavor pop! I hope he comes back to town because grilling watermelon is so darn tasty. Now, I’d be in SUPER heaven with 6 pounds of jumbo shrimp at my fingertips! Hey Kevin! The shrimp are on sale at my local store about once a month. I’m thinking next July I will get a good supply and we can each make a different recipe. Our house is small, but I have a six burner gas stove, a gas grill as well as a charcoal grill, two smokers and an outdoor fish fryer! How does that sound? 🙂 I claim cajun bbq shrimp right now! Fruit on the grill is a big hellz yea! Well, everything on the grill is a big hellz yea. lol. LOVE these skewers, Kevin! Those shrimp and the watermelon just look PERFECT! This is everything I love about summer, buddy! Is it dinner time yet, because I NEED this! Pinned! Cheers! so delicious! never grilled watermelon before, until now, will surely try this one. Beautiful photos. Thank you Carina. This is a super quick and light meal and the smokey flavor from the grill is a great twist to the watermelon. Enjoy!